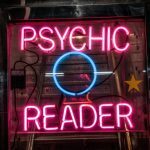 Psychics, Card readers, and astrologers get bad names by these scam readers who feed you a line. Hey, I’m not saying every reader is good as you’ll run the gamut. Do you ban mechanics because one is dishonest and took out your oil pan plug and said you’re leaking oil? If you’ve gone to your doctor and they prescribed something that made you sick and then gave you something else, do we ban pharmaceuticals or doctors? But wait! The doctor used science, didn’t he/she? So, they don’t make mistakes right? Okay, here is the gist of what I want to say. If you get a so-so or a bad reading, you may not have jibed with the reader as the connection between the two people is important. Maybe you got a bad reading because the reader is inexperienced or just plain bad. What to do? It’s simple – don’t use them again. However, keep an open mind because one buddy of mine refunded a person who two months later returned to pay him because he was accurate. She didn’t want to believe what he was telling her at the time! When to get the police involved? If you have been asked to fork over money to remove an “evil spell” or you are told you NEED to have multiple sessions then that’s a sign to run. One friend of mine gets calls from a police officer he knows to see if a package of powder has a magical charge on it. Most of the time it doesn’t and it ends up being talcum powder! For multiple sessions, an astrologer friend of mine specialises in business Horary Astrology and will answer multiple questions a week for clients to determine selling times, proposal submission times, who to hire/who to fire, etc. This type of work is ongoing, and he has an open ended arrangement set up but for personal readings you shouldn’t be going every two weeks…live your own life. They don’t make you feel pressured in any way. They give you a reading and don’t expect you to buy stuff such as jewellery, potions, or especially “spell-removal”. You will not be told that you need to re-book a reading in a short period of time. My colleagues and I figure no earlier than 4-6 months for personal readings.